Lewis Hamilton got his title defence off to a flying start with victory over team-mate Nico Rosberg at the Australian Grand Prix as Mercedes dominated the season-opener in Melbourne. 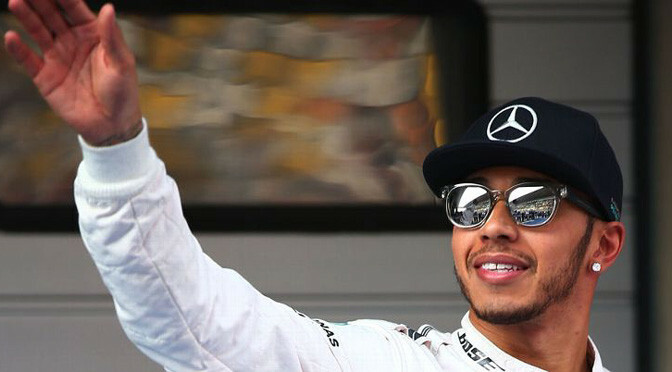 Hamilton’s victory never looked in doubt as he led from the start and maintained a margin of over a second over Rosberg for length of the race. Rosberg pushed at times but never worried the defending world champion, who managed fuel, tyres and his Mercedes W06 Hybrid to perfection over the 58 laps. Sebastian Vettel started his Ferrari career on a positive note with a podium and third place, but the gap of over 30 seconds to the two Mercedes shows the magnitude of the advantage the world champions have carried over from 2014. 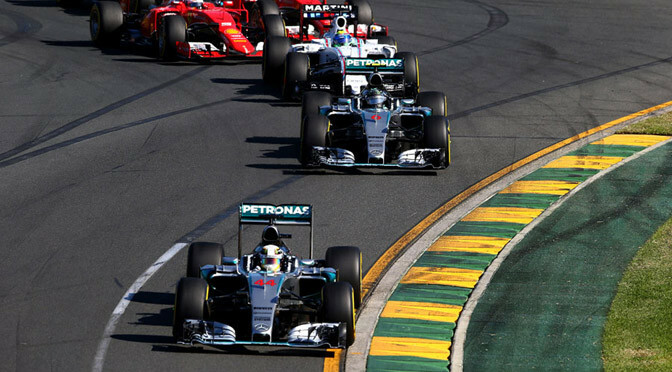 But while Mercedes put on a show of perfection for the watching world, its rivals struggled even to start the race let alone go the distance. For the first time since the 1963 Monaco Grand Prix, the season started with a field of just 15 cars as making the grid proved problematic for three drivers. Prior to the race Valtteri Bottas was ruled out with a back injury from qualifying before both Daniil Kvyat in the Red Bull and Kevin Magnussen in the McLaren suffered technical issues on the way to the grid. The first lap accounted for two more cars as Pastor Maldonado came off worse in a first corner collision and Romain Grosjean was forced to park his Lotus before the end of the lap. Maldonado was the last car in a chain of collisions that started when Kimi Raikkonen nudged team-mate Vettel and slowed in the path of Carlos Sainz’s Toro Rosso. 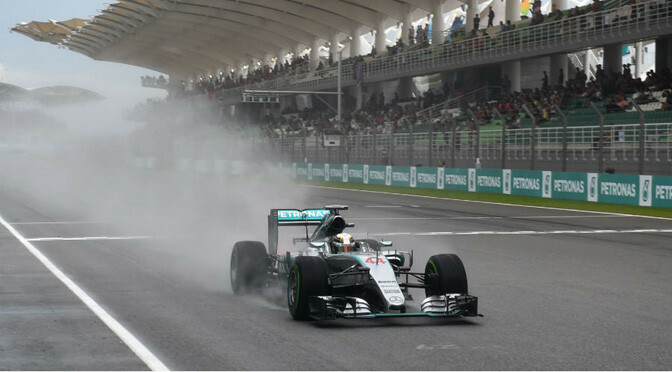 A safety car was called out to allow the marshals to clear the stricken Lotus before racing resumed on lap four with Hamilton comfortably leading Rosberg and Felipe Massa in the Williams. Further down the field Sainz dropped from fifth to seventh and Raikkonen set about recovering the places he had lost in the first corner. In attempt to give Raikkonen clean air, the Ferrari driver was the first to pit and adopted a two-stop strategy to try to scythe through the field. It appeared to be working as he set fastest laps on a new set of soft tyres but then came a cropper at his second stop when the left rear tyre was not properly fitted and he had to pull the Ferrari to one side. 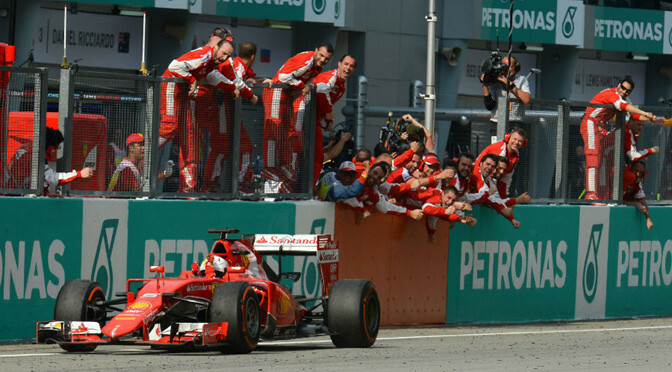 The majority of the field adopted a one-stop strategy and it was after his single pit stop that Vettel managed to get ahead of Massa. The Williams pitted three laps earlier than the Ferrari and Vettel took advantage with a series of quick laps on his old soft tyres to gain a big enough buffer to pit and hold onto third. It was the only change of position among the top four all afternoon, as Massa pushed in the second stint to try to catch up but ultimately fell 3.6s short at the chequered flag. Felipe Nasr took fifth place for Sauber and in doing so scored the team’s first points since 2013. The Brazilian rookie put in a remarkable performance to hold the Red Bull of Daniel Ricciardo and finish comfortably ahead by the end of the race. Nico Hulkenberg also put in an impressive performance to finish seventh in the Force India, which had only completed two and half test days before the start of the grand prix weekend. Marcus Ericsson had to adopt a three-stop strategy after a problem at the start forced him to pit on the first lap, but he recovered to eighth and impressed with a clean overtaking move on Sainz, who struggled to bounce back from a very slow pit stop on lap 24. Sergio Perez took the final point on offer in tenth, depriving his old team McLaren of a point on its debut with its new Honda power unit. Although Jenson Button finished the race for McLaren, it was not a convincing performance as he finished a distant 11th. Combined with Magnussen’s smoky engine failure on the way to the grid, the enormity of the challenge facing McLaren is starting to become clear. Max Verstappen also retired from the race after a couple of puffs of smoke from the Renault engine in his Toro Rosso, bringing a halt to his F1 debut on lap 34. Lewis Hamilton took a stunning pole position for Mercedes at the season-opening Australian Grand Prix as McLaren-Honda qualified last. 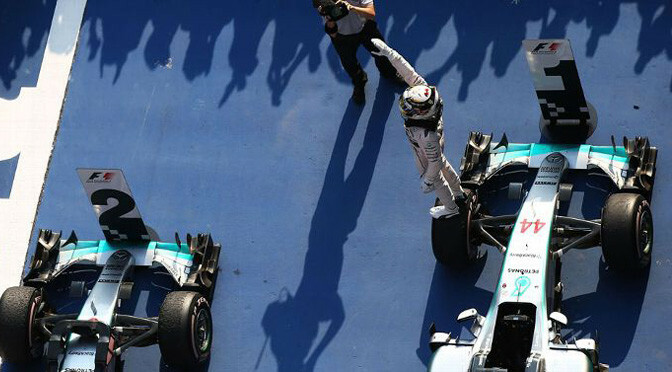 The world champion beat team-mate Nico Rosberg by more than half a second as Mercedes utterly dominated. Williams’s Felipe Massa beat Ferrari’s Sebastian Vettel to third. Meanwhile, McLaren produced their worst performance for six years as their big-budget new engine partnership with Honda got off to a terrible start. “It has been a great start to the weekend,” Hamilton said. “It doesn’t feel that long since the last race. It has been a big rush and huge effort form the factory to get us here with this performance. Williams won a tight battle with Ferrari, with just 0.072secs separating Massa in third from Kimi Raikkonen in fifth, with Sebastian Vettel in between in fourth place. But for all the talk of a Ferrari revival, the Italian team were 1.43secs slower than Hamilton – only 0.2secs closer than they had been last year, when their former driver Fernando Alonso qualified fifth. Following his move to McLaren, Alonso is missing this race to recover from concussion suffered in an accident in pre-season testing. But even he would have been able to do nothing about McLaren’s poor performance – their faster driver Jenson Button in 16th place was 1.5secs off getting out of the first knock-out phase of qualifying and an effective four seconds slower than Mercedes once the effect of tyres was taken into account. Button, who beat team-mate Kevin Magnussen by 0.6secs, remained upbeat about the potential of the new partnership with Honda. “We know we can make big strides with this car,” Button said. “When you have a car that feels good underneath you can add downforce to it and that is what we need to do. “That’s not saying downforce is a problem. The car is completely new, and obviously the power unit. Another team to struggle were former world champions Red Bull, for whom Daniel Ricciardo could manage only seventh fastest, behind Williams’s Valtteri Bottas. Red Bull bosses are furious with engine partner Renault, who have failed to deliver any performance improvements over the winter while the engine is harder to drive than it was last year. Spaniard Carlos Sainz impressed on his debut with Toro Rosso with eighth place, outdoing team-mate Max Verstappen, who qualified 12th on the occasion of setting a new record for the youngest driver to compete in F1 at 17. The Lotus drivers Romain Grosjean and Pastor Maldonado completed the top 10, as Sauber’s Felipe Nasr, another rookie, was a strong 11th. 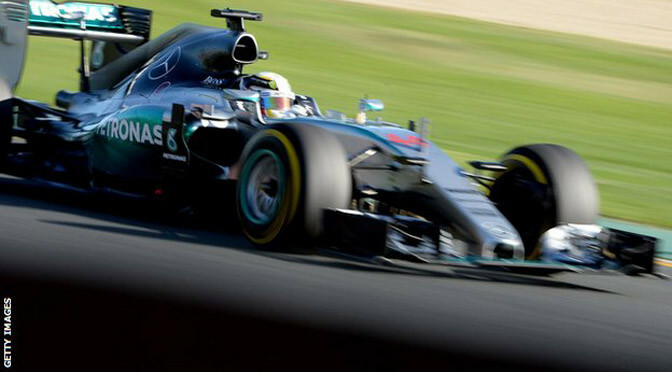 Mercedes driver Lewis Hamilton dominated final practice at the season-opening Australian Grand Prix. 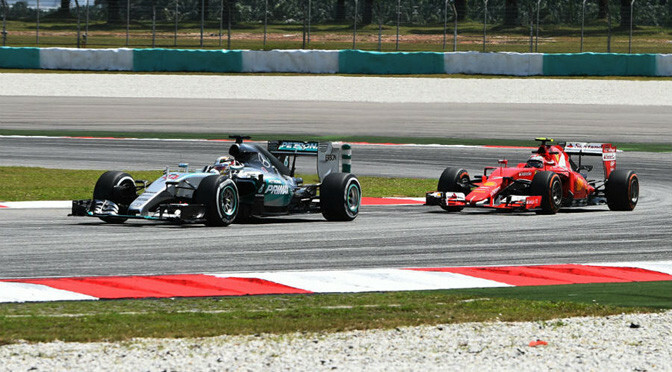 The champion was 0.696s seconds clear of his closest challenger, Ferrari’s Sebastian Vettel, with Hamilton’s team-mate Nico Rosberg third. Williams’s Valtteri Bottas and Felipe Massa were next, then Ferrari’s Kimi Raikkonen and Lotus’s Romain Grosjean. Red Bull’s Daniel Ricciardo was only 13th, and McLaren’s Kevin Magnussen and Jenson Button were 14th and 16th. McLaren-Honda look likely to qualify at the back. They were 3.5 seconds off the pace and ahead only of Red Bull’s Daniil Kvyat, who did just six laps because of engine problems. The two Manor cars did not run, and are now unlikely to take any part in this weekend. Hamilton was untouchable throughout the session, fastest from Rosberg in the first part on the medium tyre by 0.2secs and then in a different league when the teams switched to the soft tyres that will be used in qualifying. 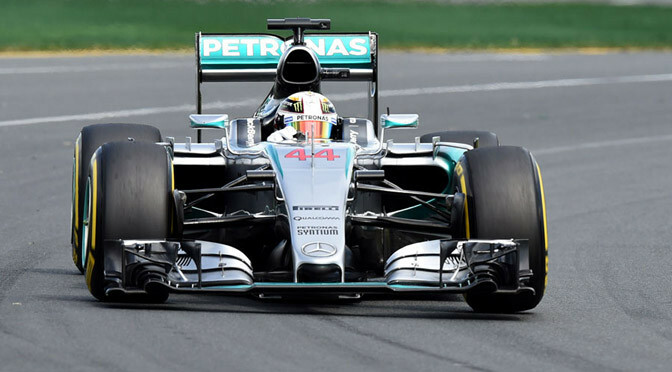 Hamilton was 0.954secs faster than Rosberg on the soft tyre. The German did two laps within 0.1secs of each other. Mercedes said Rosberg did not have any particular problem but did not hook his lap together. The two Mercedes cars looked a handful – both Hamilton and Rosberg ran off the track during the session – but are clearly on a separate level from any other car. Vettel’s pace underlines the belief that Ferrari are in a more competitive position this year after making a big step in the performance of their engine and improving the drivability of their car, too. Raikkonen was 0.454secs slower than Vettel, a similar sort of margin to the advantage Fernando Alonso typically had over the Finn last season, which was Ferrari’s worst for 21 years. Alonso has moved to McLaren but is missing this race after suffering concussion in an accident in pre-season testing last month. His team admit they do not know when the Spaniard will return, or what caused his accident.